Now I worked one day on it, but it will not work. I'm pretty shure it's a driver problem, but I cannot figure out what the problem exactly is. Before, I worked with STM32F4, and the the toolchain runs very smart. Now, the SAM4 parts are available and we like to switch over because we use AVR's and AVR32's in many other projects, and it seems to be good idea to have the same IDE for all projects. Ok, so far, so good. To start with these thing, I bought a couple of SAM4S XPLAINED Kits. But it's not possible for me to write any demo to the device, because the device programming dialog allways tells me, it's not possible to connect. 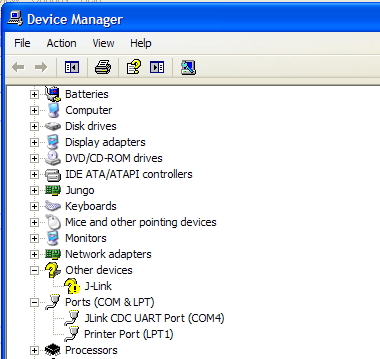 If I plug the SAM4S XPLD in (JTAG-Port), the windows device manager tells me, there is a "JLink CDC UART Port (COM23)" and in the USB-Section a "J-Link OB CDC". One green LED (at 10 o'clock from the USB connector) is constantly on. Everything looks fine, but I will allways prompted to "wait 1 more minute" and so on. I tried a lot of things, including reinstallation of all the software, with no success. Has anyone a further idea?! When I plug in my SAM4S Xplained at the USB connector end of the board I see two green LEDs lit, one above the TQFP on the left side and one at about its 8 o'clock position. But my Device Manager look very different. See the Snapshots.